The role of the Financial Wholesaler, Institutional RM and Account Executive is becoming more competitive and challenging each and every day. In addition to being responsible for management of a complex suite of products, services and content, these professionals are responsible for marketing these financial services to the most sophisticated financial industry subject matter experts and top performers. Furthermore, as new, non-traditional firms enter the contest to capture the attention of the institutional financial client, the overall level of competition has heated up, both in terms of improved quality strategic coverage and number of competitive offerings and products. To compete and win in this space Wholesalers, Institutional RM's and Account Executives must posses the ability to create deep relationships and communicate effectively with some of the most sophisticated, challenging and time constrained players in the financial industry. And that means developing an incredibly high level of EQ. 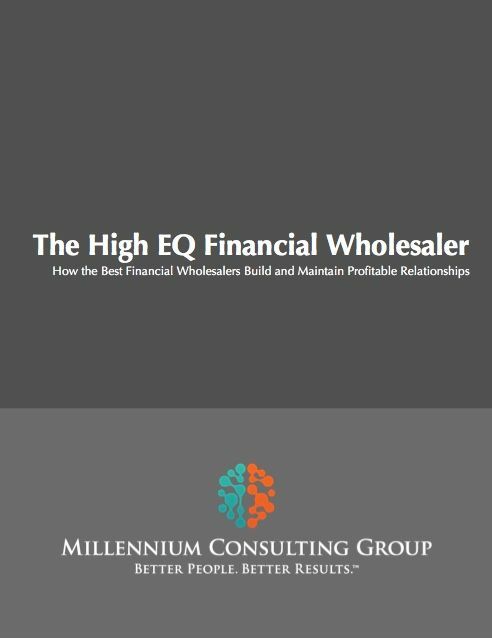 Our High EQ Financial Wholesaler workshop is designed to immediately and positively impact Wholesaler, RM and Account Executive EQ levels by working with them to understand and develop the personal development and relationship development mindsets and skill sets of the most successful in the industry. This fast paced, highly practical and highly interactive program takes the EQ discussion beyond general theory by delivering industry specific functional best-practices that will challenge participants to elevate the quality of their personal growth and relationship development efforts.